The bean pot was an absolute necessity for the style of cooking then coming into vogue. 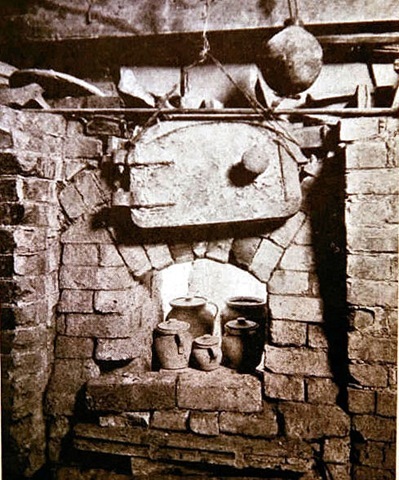 A deluge of cook books detailed the many new ways to prepare food as open hearths gave way to Franklin stoves. Lydia Maria Child’s 1829 “The American Frugal Housewife” was a top seller (until Fanny Farmer’s “Boston Cooking-School Cook Book” swept the field in 1896). Lydia Maria Child was also known for her abolitionism, women’s rights advocacy and anti-expansionist views. Her book included not just recipes but remedies, advice, and tips for housekeepers. Nothing tasted the same if not baked in a bean pot. Potters happily promoted the notion, for obvious reasons. And many, like the Risley’s, encouraged neighbors to bake their beans near the kiln fire mouth. Notices to that effect were common in local newspapers. From a Norwich Packet ad of November 21, 1788: “Baking done as usual and the smallest favors gratefully acknowledged.” A popular Norwich recipe was Mummychung chowder, made with fish caught in the Yantic River that ran next to the Pottery Works. …But everything changed on the morning of December 24, 1881. George Risely, Sydney’s son who had taken over the shop in 1856, came in to turn up the boiler. The boiler exploded. All that was left was a crater where the shop used to be. The Art of the Potter. Diana and J. Garrison Stradling,. Main Street-Universe Books/New York. 1977. The Reshaping of Everyday Life, 1790 – 1840. Jack Larkin. Harper and Row/NY. 1989. You are currently browsing the archives for the Sydney Risley category.